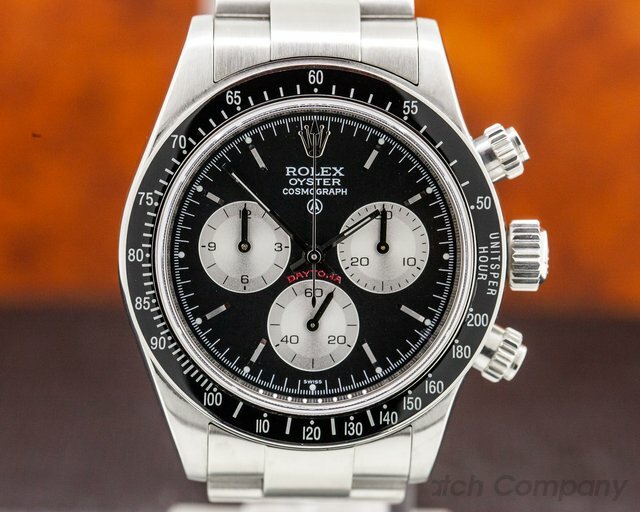 29578 Artisans De Geneve Tribute to Daytona 6263 II "Big Red", based on the Rolex Daytona 116520, very limited production, stainless steel on a stainless steel Oyster bracelet, modified automatic Rolex caliber 4130 movement with a 22k gold rotor, chronograph, black "Big Red" dial is hand painted and takes 9 craftsmen 78 hours to complete, black tachymeter bezel is bakelite and made entirely in house, screw-down pushers, sapphire crystal, water resistant to 100 meters, display back, diameter: 39mm, thickness: 13.5mm. Like New with Original Box and Papers; dated 1/2018. 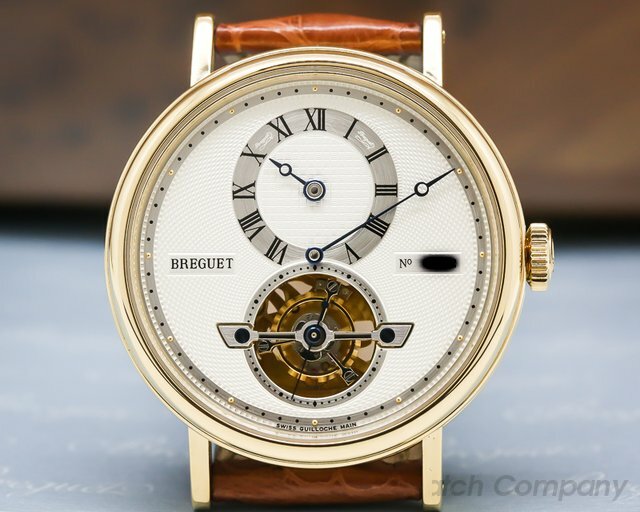 31337 Breguet 5307ba/12/9v6 Tourbillon Automatic Regulator, 5307ba129v6, 18k yellow gold on a strap with a yellow gold Breguet deployment buckle, automatic Breguet caliber 587, Tourbillon cage at the 6 o clock position, 120 hour power reserve, hour indicator at 12 o clock dial, minute hand goes around the entire dial, two pattern silver guilloche dial, painted black roman numerals, sapphire crystal, display back showing the hand engraved Breguet movement, size 39mm, thickness 10.7mm, Like New with original box and papers dated 2 / 2006. 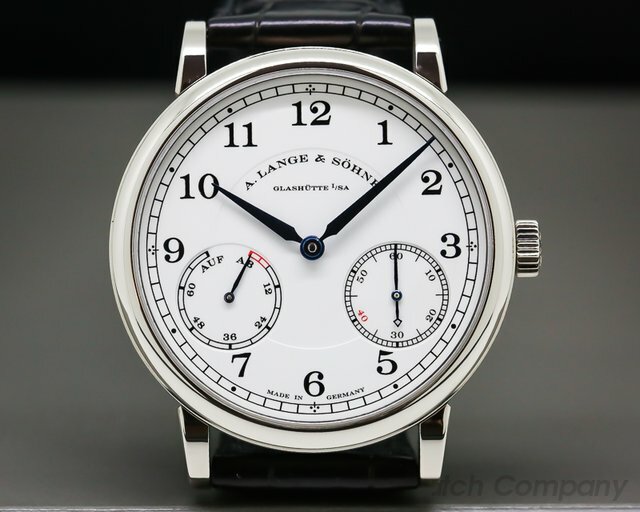 31359 A. Lange & Sohne 234.049 1815 Up & Down for Cellini 234.049. 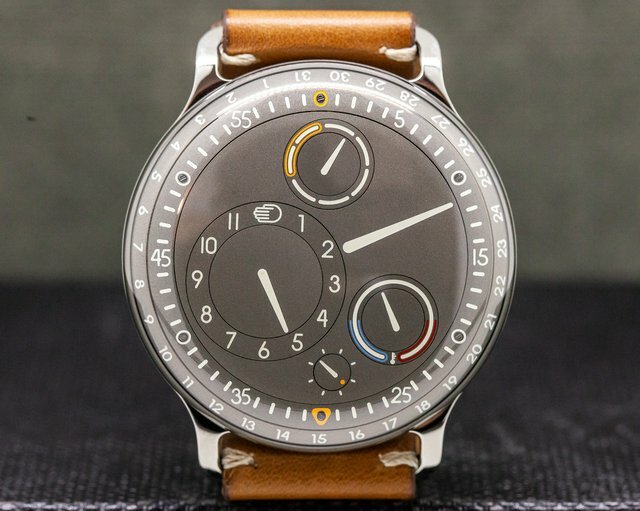 Released in 2017 to celebrate Cellini's 40th anniversary and limited to 40 pieces, 18k white gold on a strap with an 18k white gold tang buckle, manual wind Lange caliber L051.2 movement, 72-hour power reserve, beautiful white lacquer dial with black painted Arabic numerals and a red "40" in the sub seconds, blued steel hands, small seconds and power reserve, sapphire crystal, display back, size: 39mm, thickness: 8mm. 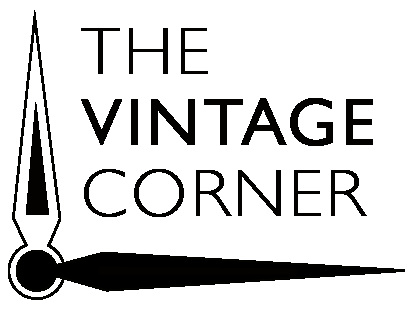 Like new with original box and papers dated July of 2018. 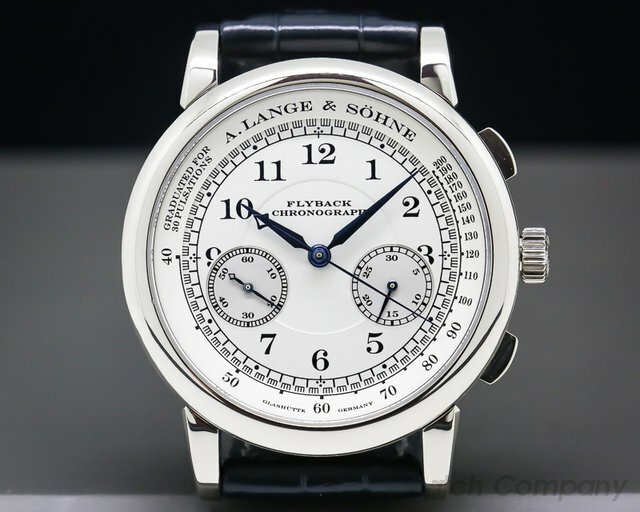 31361 A Lange & Sohne 401.026 1815 Chronograph Fly Back, 401026, 18K White Gold on Strap with an 18K White Gold Buckle, Manual Wind Movement, Chronograph with Flyback Function, Pulsimeter Scale, Small Seconds Between 8 & 9, Silvered Dial with Black Roman Numerals, Steel Blued Hands, Sapphire Crystal, Water Resistant, Display Back, Diameter: 39mm, Thickness: 11mm, Like New with Original Box and Papers dated 2010. 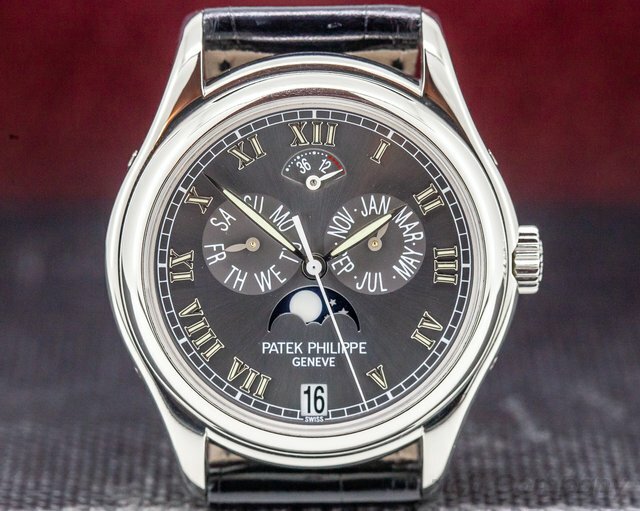 31365 Patek Philippe 5056 P Annual Calendar Power Reserve, 5056P, 5056P-001, platinum case on a strap with a platinum tang buckle, automatic Patek Philippe caliber 315 S IRM QA LU aut, day, date, month, moon phases, grey dial, power reserve indicator, centered sweep second hand, display back, sapphire crystal, size: 37mm, thickness: 11mm, Like New with box and stamped papers. The paper is dated 12/1999. 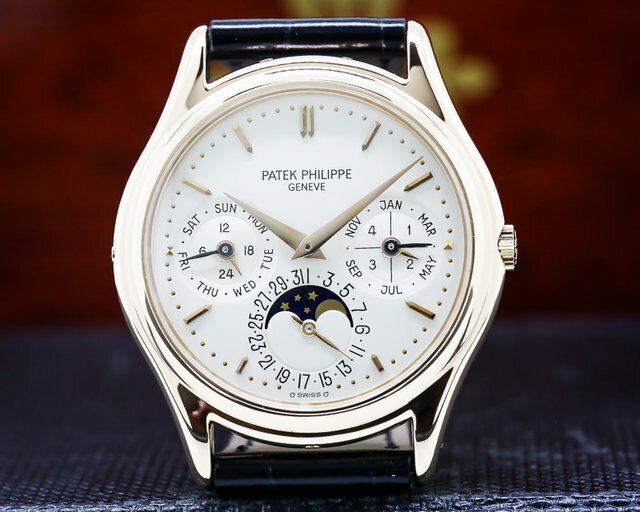 31370 Patek Philippe 3940R Perpetual Calendar 3940R, 3940R, 18K rose gold on a strap with an 18K rose gold tang buckle, automatic perpetual calendar (English) with, day, date, month, moonphase, 24-hour indicator, leap year indicator, silver dial with rose gold stick markers, sapphire crystal, water resistant, diameter: 36mm, thickness: 9mm. 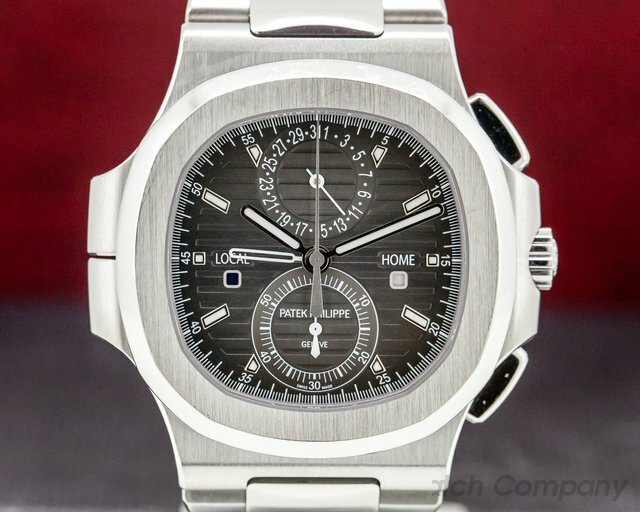 Like New with original Patek box, archive certificate, and original certificate dated July of 1989. 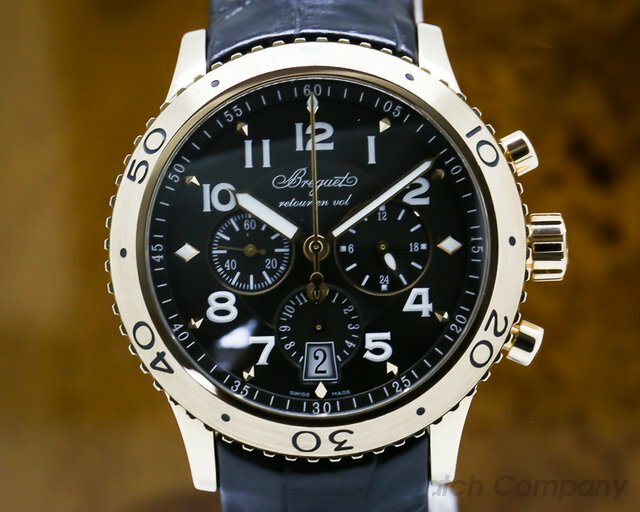 31377 Breguet 3810 BR Type XXI Flyback 3810BR929ZU, 18k rose gold on a strap with an 18k rose gold deployant buckle, automatic Breguet caliber 582 Q movement, 12-hour chronograph with fly-back function, brown dial with luminous hands and Arabic numeral hour markers, 24-hour indicator, centeral minute counter, date at 6 o'clock, small seconds at 9 o'clock, bi-directional rotating bezel, water resistant, sapphire crystal, diameter: 43mm, thickness: 15mm Like New with Original Box and Papers; dated 5/2013. This watch was fully serviced by Breguet in May 2016. 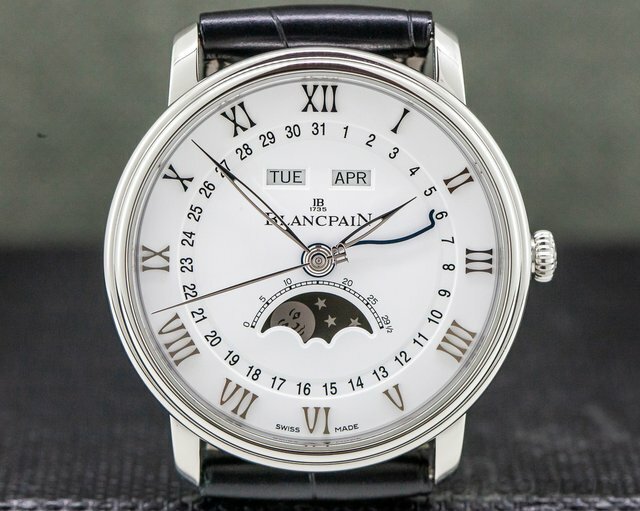 31379 Blancpain 6654-1127-55b Villeret Complete Calendar Moonphase, 6654112755b, stainless steel on a strap with a stainless steel deployant buckle, automatic Blancpain caliber 6654, blue serpentine date hand, day, month, moonphase, white dial, applied Roman numerals, display back, diameter: 40mm, thickness: 11mm, sapphire crystal, water resistant, like new with original box, receipt, and papers dated December 2014. 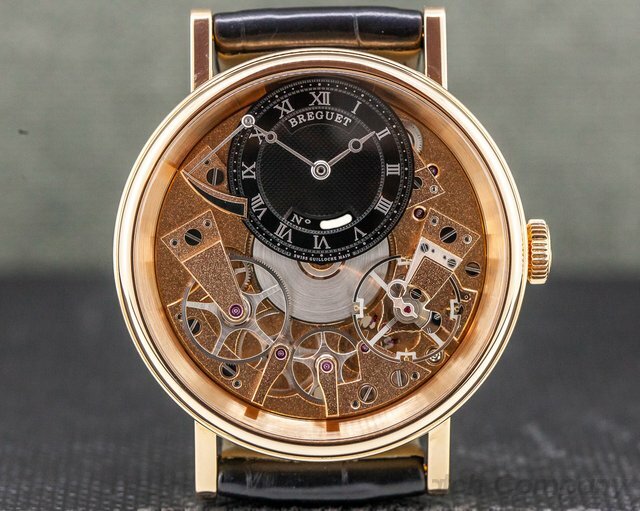 31381 Breguet 7057 BR La Tradition, 7057BR/R9/9W6, 7057BRR99W6, 18k rose gold on a strap with an 18k rose gold buckle, manual wind Breguet caliber 507 DR1 movement, off-set black guilloche dial with silver Breguet-style hands and silver Roman numeral hour markers, power reserve indicators on both front and back of the watch, 50-hour power reserve, diameter: 40mm, thickness: 12mm, display back, water resistant to 30 meters, like new with original box, receipt, and papers dated February 2015. 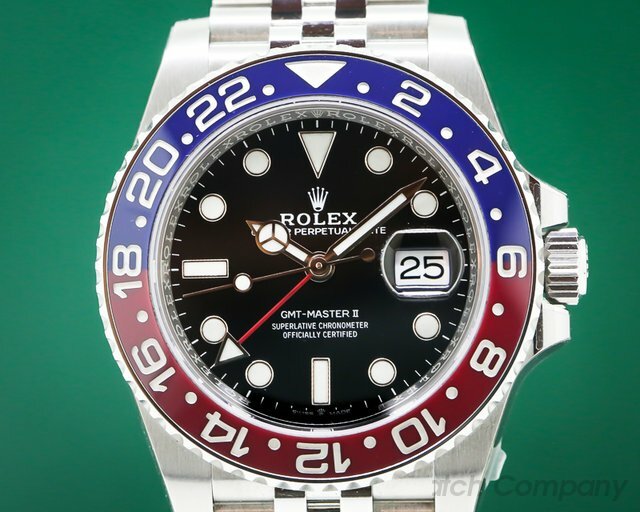 31408 Rolex 126710 GMT Master II "Pepsi", 126710 BLRO, stainless steel on a stainless steel Jubilee bracelet, new in-house automatic Rolex caliber 3285 movement, blue and red ceramic bezel with silver Arabic numerals, date at 3 o'clock, triangular GMT hand, COSC, sapphire crystal, water resistant to 100 meters, diameter: 40mm, thickness: 12mm, scrambled serial number. Unworn and fully stickered with box and papers dated December of 2018.